I'd be lying if I said at one point I thought myself to be one of the biggest Harry Potter fans in the world. I remember saying "J. K. Rowling could probably write a book about poop and I'd love it." Boy, was I wrong. 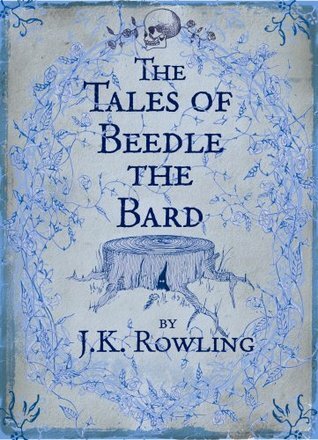 I was excited to finally read THE TALES OF BEEDLE THE BARD after hearing so many people talk about it through the years. It's been sitting on my shelf collecting dust and my Boyfriend finally convinced me I should give it a shot. I had tried numerous times before and always had issues getting through the first story. I felt like none of the stories meshed well together and it felt very disconnected Don't get me wrong, I totally understand it's a book of fairy tales, I guess I was expecting something more from Rowling. It took me a few months to finish the book--I can usually read through a hundred pages in a half hour/hour max. I remember hearing several people mention they were excited to read the fairy tales of wizarding children. However it felt like I had read something rushed and took very little from the book when finished. This book isn't for everyone, as the Quidditch Throughout The Ages & Fantastic Book of Beasts and Where to Find Them aren't mentioned by many people anymore. This book helped me realize I won't like everything from my favorite authors and that's okay. (Which was my biggest fear.) It's even okay to blog about it.